The Thinkcentre X1 is a very sharp-looking All-in-one computer that's good for home or the office. But the screen might feel constrictive for some people. Also Australians are paying told to pay hundreds of dollars more than Americans. All-in-one PCs ideally look good, save space, minimize clutter, and allow unrestricted access to the surface they reside on. None that I’ve seen have fully realised such design goals—until now. Lenovo’s ThinkCentre X1 hits those targets dead-on. Unfortunately, however, Australia is being hit with price hike of hundreds of dollars. It's not as bad as the ridiculous 241% increase that Dell foisted upon us recently, but we're a bit sick of it. Is the Thinkcentre X1 still worth buying though? 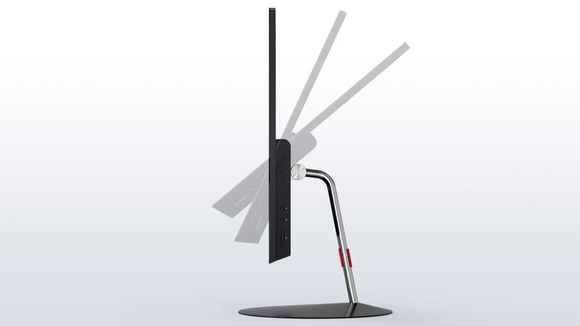 The Thinkcentre X1 is thin, and quite light at 4KG sans stand. This all-in-one is also easy to use and fast enough that if I had to use it for my everyday computing, I’d be perfectly happy. And that’s despite the handful of changes that the ThinkCentre X1 could benefit from, like different colour-coding for the always-on USB 3.0 port and the power jack, and options for a 4K UHD display or a touchscreen. 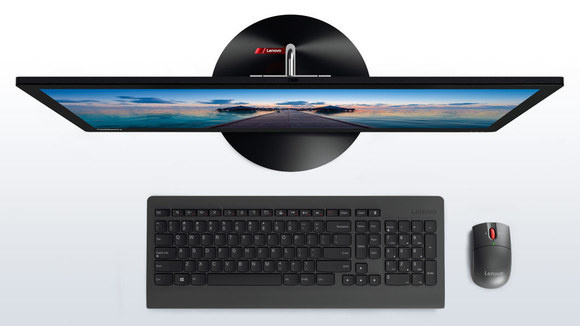 The Thinkcentre X1 comes styled in the usual Lenovo charcoal-gray color scheme, with a 23.8-inch, 1920 x 1080 non-touch display featuring an anti-glare coating. Said coating works pretty well, but this particular type reminds me of the haze you get on mirrors. The X1 would be better with a full matte panel, like the one on Toshiba’s Z20t-C2112 laptop. That doesn’t detract from the ThinkCentre X1’s excellent design, though. The key aspect of such success is the X1’s stand. Its base is so thin that you can treat it as part of the work surface. Yet the X1 gives no feeling of instability—it should withstand being pushed around for repositioning without falling over. Another two factors are the unit’s wide range of tilt, and the low amount of pressure needed to adjust it. The result is hassle-free access to anything you’ve stored behind the machine, and less frustration when connecting cables or dongles to the rear ports. 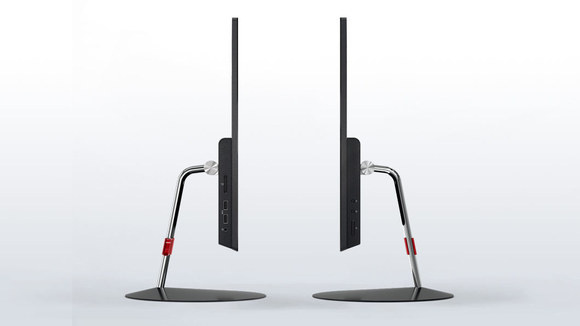 The Thinkcentre X1 tilts to far greater angles than the average AIO, and doing so doesn’t take a lot of force. A further sign of the the X1’s thoughtful design is the arrangement of its ports and switches. Everything you’re likely to leave plugged in connects to the back of the system: gigabit ethernet, Kensington lock port, power jack, a bi-directional DisplayPort 1.2 port, and three USB 3.0 ports. For more daily use, you’ll find two USB 3.0 ports (one of which is always on, for charging purposes), a combination headphone/microphone jack, and a media card slot on the lower left hand side. On the lower right hand side of the X1 are the power button, mute button for the microphone, and computer/display switch. 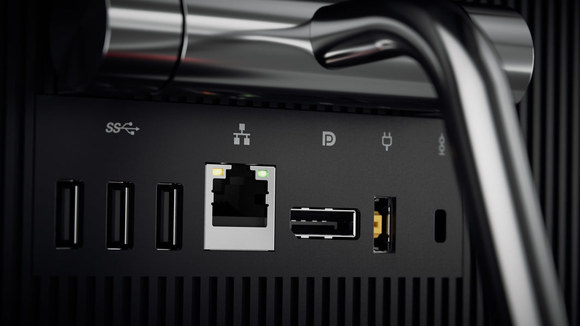 The latter is there because the bi-directional DisplayPort connector gives the option to drive another display or output to the Thinkcentre X1’s screen from another computer. Of course, if you’re a lefty, you might prefer the side layouts reversed, but the general clustering was a good decision. The ThinkCentre X1’s ports are perfectly arranged and situated, though we wish the always-on USB port (not shown) weren’t the same yellow as the power jack. One potential drawback is the lack of height adjustment. Taller users might want to opt for an arm mount—the Thinkcentre X1 weighs only 4KG, which even stylish lightweight arm-mounts can handle. You will need to buy a VESA mount, however. One other thing I should mention is that the arm of the stand is so thin, you’ll likely be able to see the cords, especially as it’s chrome. Black might have been better choice for the wire-haters out there. Inside the ThinkCentre X1 are an Intel Core i5-6200U processor, 8GB of DDR4/2133MHz RAM, a 256GB SATA SSD, and an Intel Wireless-AC 3165 card for dual-band 1x1 802.11ac WiFi and Bluetooth 4.2. As expected with this choice of components, the ThinkCentre X1 is as fast as most people need for everyday tasks, like word processing and web browsing. 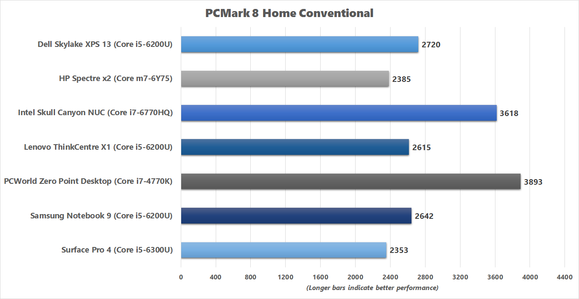 In PCMark 8’s Home Conventional benchmark, which runs web browsing, writing, casual gaming, photo editing, and video chat workloads, this all-in-one machine scored 2,615. While processors with more cores and more power do outpace it, the X1 should feel plenty quick for basic tasks. The ThinkCentre X1 also performed as expected in our Handbrake encoding test, which involves converting a 30GB MKV file into a smaller MP4 using the program’s Android Tablet preset. 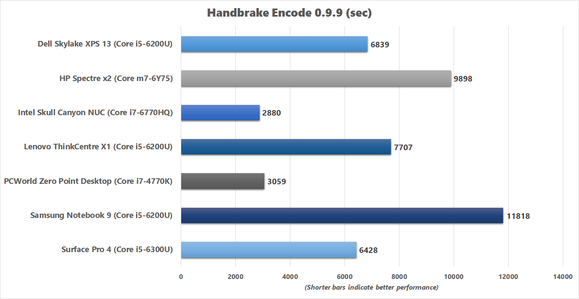 For machines using a thermally constrained CPU, Handbrake is more of a soak test than a measure of performance: We use it to see how well the machine holds up under long, intensive tasks. Gaming on the ThinkCentre X1 is slightly below what you’d expect for its integrated HD 520 graphics. 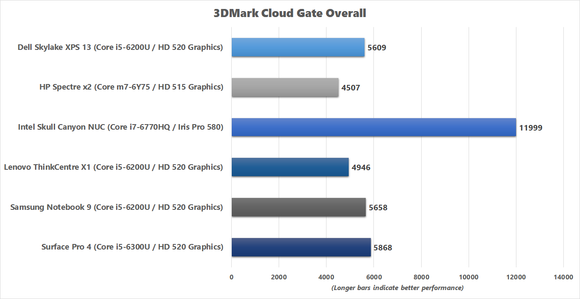 In 3DMark’s Cloud Gate benchmark, which is a synthetic DX11 test designed for typical home desktop systems and laptops, the X1 netted an overall score of 4,946. While that’s a little surprising, it again likely has to do with how Lenovo tweaked the fan profiles. However, even if the X1 had matched other Core i5-6200U systems’ scores, that wouldn’t change the fact that this all-in-one is only good enough for lightweight games. As for video playback, 4K UHD files played quite smoothly, as long they were H.264 and not HEVC (H.265) or 60 frames per second. The Thinkcentre X1’s SSD, a Samsung MZ7LN256HCHP-000L1, has a middling write speed of a little less than 300MBps, but it reads at a reasonable pace of 500MBps. To be fair, while faster SSDs are available, this kind of throughput speed is still light years better than a hard-disk drive. One aspect of the X1 that could be better is its speakers. There’s Dolby software on board to enhance the sound, but it’s still a bit weak. You’ll definitely want to use headphones or hook it up to a sound system. The keyboard and mouse provided by Lenovo are usable. They likely won’t beat out anything you already love, but they have enough heft that they don’t feel cheap. They’re also wireless, so there are no cables to litter the clean desktop space generated by the X1’s design. You can get a Thinkcentre X1 for as little as $1,699 at the time of this review. It's a bit disappointing that the lowest spec in the US costs US$865 ($1113). Even with 10% GST added you're still looking at paying some $500 more and that's with only a Core i3 processor, 4GB of system memory and a 500GB mechanical hard drive. I highly recommend against that configuration because of the slower performance you'll get from the hard drive compared to an SSD. Our 8GB/256GB SSD configuration costs $2,229, and you’ll be much, much happier with it (or even the 128GB SSD) than the HDD version in the long run. The standard warranty is one-year on-site. Look Ma! No wires. Actually, you will see some such as the power cord and ethernet cable, which are not shown here. One more plus for the Thinkcentre: The user’s guide shows you how to repair and upgrade the X1, which is quite easy. I’m little tired of vendors who say there are no user-serviceable parts when a mere half-dozen screws would allow access. Kudos to Lenovo. To be perfectly honest, I’d like to see Lenovo take the outstanding basic Thinkcentre X1 design and realize it to the max: a 4K UHD touchscreen display, a PCIe-NVMe SSD, Type C USB 3.1, and...a red (not yellow) always-on USB port. As it stands, however, 1080p is all most users need. The Thinkcentre X1 is easily fast enough. It's just a crying shame that Lenovo has whacked on hundreds of dollars for no apparent reason for the Australian market as this dents value. otherwise we'd say that if you’re looking for a solid-performing, exceptionally well-designed all-in-one, this machine is a decent choice.